The original idea for this project started with our group's need to make something interesting and challenging, without a large investment in training with hardware. Given our interest in computer games and graphics, we decided that making a video game system of our own would be a worthwhile venture. This choice also met a need to use hardware with a modest learning curve, since we had dealt with LCD controllers and keypads in previous lab sessions. Basic functionality would therefore be easy enough to implement, but still result in a fully functional final product. The project also presented great potential in expansion; adding sound, more options, enhancements to the graphics and the gameplay were all things that would contribute to the product, but were not absolutely necessary to its success. Every basic gaming system has a number of integral pieces. Firstly, there is the hardware, consisting of an input subsystem, an output subsystem, and processing logic that determines how the input effects the output. The software pieces include the game engine itself (an implementation of the rules of the game), and the two sets of drivers that interface with the input and output subsystems. These pieces will be explained in greater detail under other sections of this documentation. The rules for the video game are simple. 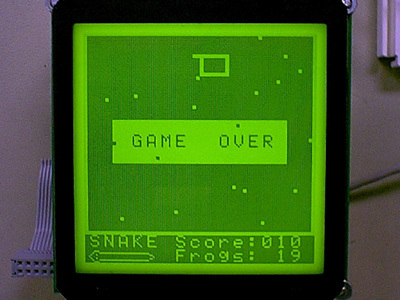 You are a "hungry snake" whose sole purpose in life (at least in this game) is to consume frogs. Since the frogs are unwilling participants in this game, you will have to go and catch them as they wander the playing field. Now obviously, your hunger will drive you to continually chase the frogs until you have completely finished your meal. Of course, nothing in life is ever easy, so we (as the game designers) have placed you in a pit surrounded by an electrified fence. Touch the fence, and its barbecue time, folks. Also, since you are poisonous, biting yourself is an obvious no-no. And just to make things more interesting, we (as gods) have decided that you have to grow in length with each frog you eat (conservation of energy). For an interesting challenge, we've decided to let you control how hungry you are; the greater your hunger, the faster you will want to finish your meal, and the more agitated the frogs will become. Points are awarded for both the number of frogs you've eaten, and the time you take to do so. Bon Apetit! Given the complexity of the game engine and the high probability of generating bugs in assembly language, we made the decision to stick with C programming (using CodeVision). With a bit of investment in training with the C compiler, we were confident we could write the engine without any great difficulty. The flexibility of writing in-line assembly would also allow us to embed I/O drivers directly into the software itself. The one great drawback to using C was the memory overhead that was required to make a structured programming language work. This meant that we had to be very careful with our RAM usage, and even more considerate of the limitations of the hardware (execution speed and instruction count). So basically, we used drivers we wrote ourselves to interface with the SNES Control Pad and the T6963C LCD Controller, implementing the functions we thought we would need. The rest of the game structure was planned around these function abstractions. We also knew that we could not depend upon getting an STK-200 board with the AT90S8535 on board, since so many other groups were using them. We tried to make our code as light as possible, and without the need for any board or microcontroller dependent hardware. That meant no multiplies (only shifts and additions), frugal usage of on-board RAM, and heavy utilization of the VRAM on the LCD to hold information on the game state as well. More will be outlined on these topics later. Collision detection was handled by checking the VRAM, since we did not have enough RAM on-board to maintain a completely internal game state. Since both the LCD and the SNES Control Pad had their own controllers, writing drivers was a matter of writing the signals expected by the interface and then reading the values the controllers sent back. 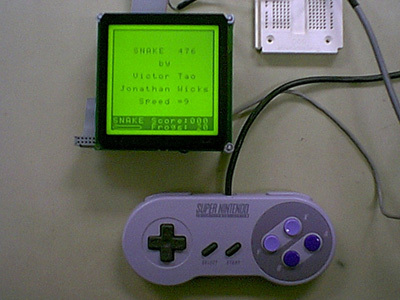 The SNES Pad utilized a simple serial interface, while the LCD used a parallel communication scheme that was much like the LCD we used in previous labs. We chose to use Port D for LCD control and Port B for LCD data because of wiring issues. Port A was set to interface with the Control Pad, and Port C was wired to the LEDs for debugging. As mentioned before, we split our project into several sections, both in hardware and software. What occupied us for the first two weeks was procuring the hardware we needed and creating the interface and drivers required to utilize them. We wanted to use a control pad rather than build our own hardware, both to show that we could make use of available standard components (including the buttons) and because we wanted proven packaging for the controller. The Control Pads we investigated generally came in two flavors. Analog controllers used potentiometers to generate the analog voltage signal readable by an ADC. Digital controllers allow for reading combinations of the 4 cardinal directions, by generating a digital signal suitable for any digital port to read. Digital controllers also tend to debounce their own buttons, because they must tell the system exactly what the state of each button is. Since the microcontroller would be busy handling the game engine, we did not want to worry about debouncing the buttons on the controller. Upon examining several options for controller devices, we settled on the SNES Control Pad because we were able to find detailed information on the communications protocol it used. Debouncing was handled internally, and the timing issues of the serial interface appeared simple to accommodate. The Controller has three data pins, a +5V power and a ground. Power was drawn of Pin 7 on Port A by setting it high, while ground was connected to Pin 9 (GND) on Port A. The other data pins, Serial Data, Data Clock and Data Latch were set to Pins 0, 1, and 2 on Port A, respectively. A signal high on the Data Latch bit for a 12 us interval signals the controller to start sending data. A sequence of 16 pulses (6 us high, 6 us low) clocks out the serial data (8 buttons + 4 directions + 4 unused signals) on the Serial Data line. The serial data is negative-edge triggered. Obtaining the input was a matter of precisely timing in the code used to manipulate the 3 control/data lines. Further detail on this topic can be found in one of the links at the end of the project documentation. We had originally considered using the 240x128 LCD that was available in the lab; unfortunately, that meant we had to compete for LCD usage time against the two or three other groups planning on using it. Furthermore, the resolution on the LCD was not quite what we wanted in our display. After some browsing, we decided to purchase a 128x128 LED-Backlit LCD from the manufacturer of the other LCD (Micro Electronics in Santa Clara, CA) because of the Controller it came with � the T6963C Controller from Toshiba, the backlight option, and the price point ($65). Since one of the projects last year used an LCD with the same controller, we figured we could draw information and experience from it. Furthermore, besides Micro Electronics, we could not find any distributors (or manufacturers) really willing to part with just one display. 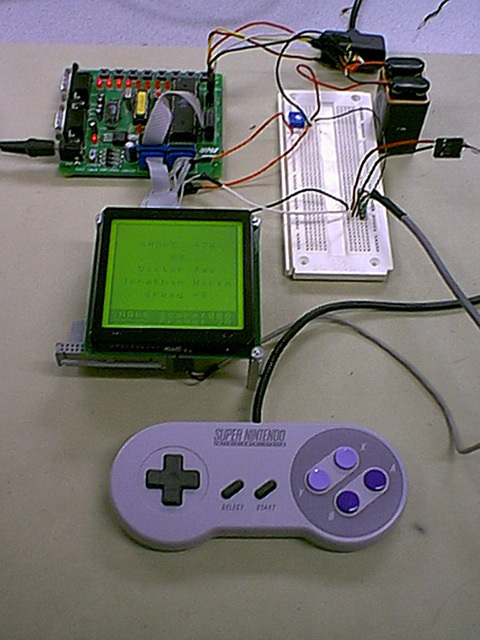 The LCD interface consisted of two pins for the backlight, and a 20 pin connector for the LCD itself and the Controller. Essentially, we were dealing with three subsystems here: the Backlight, the LCD itself, and the control logic for the LCD. Each one had its own power requirements, which made wiring the LCD very hairy business. To complicate things, the documentation was shoddy at best, requiring several calls to the company, a pound of educated and inferred guesswork, and a half a pound of luck. After everything was said and done, we wired Vdd to Ground, Vss to a +5V regulated lab power supply, Vee to a �18V supply (via  9 Volt Duracell Batteries), Vo to a trimpot to allow for contrast adjustment (from �18 V to 0V), and the +5V backlight power to the regulated power supply. To complicate things even more, the current draw on the backlight was 380 mA, meaning that the only readily available power source suited for the task would be pushed close to its 500 mA fuse limit. 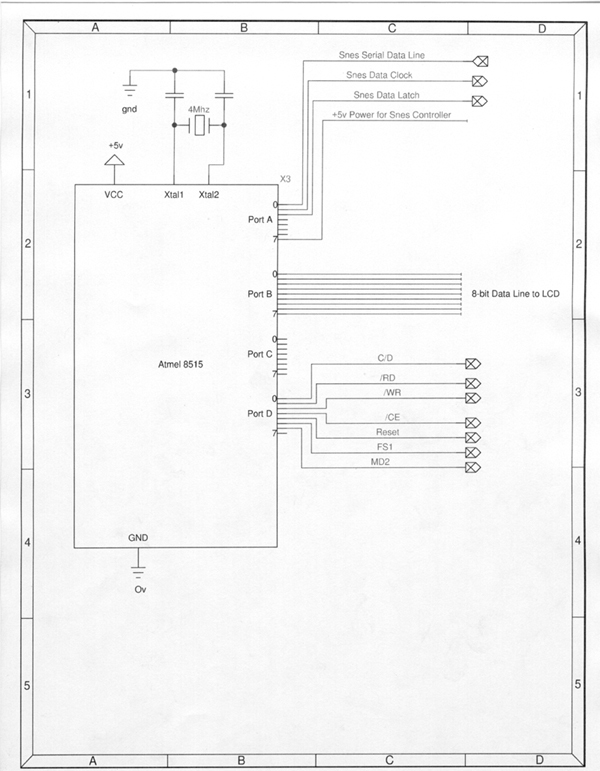 Power to the logic was provided through Vss and Vdd, and Vee and Vo are used to drive the LCD. The other pins to the LCD were split between Command and Data pins. The datapath was 8-bits wide, fitting snuggly into the Port B connector. The Pins on Port D were set up to correspond with the 7 control lines on the LCD: `RD, `WR, C\D, CE, `RESET, MD2, and FS1. All of these pins directly fuse with the corresponding pins on the T6963C. 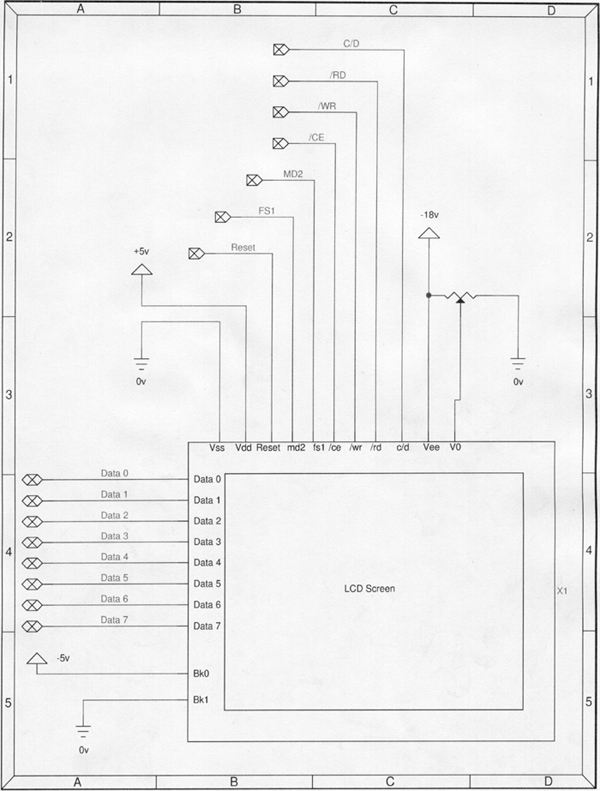 `RD and `WR were used to control the read and write cycles of the LCD controller, while CE was used to signal the controller to get ready for communication, and C\D determined whether the controller should look at the data lines as command or data (command = high, data = low). `RESET was set high only when we wanted to reset the system (during power on). We followed the recommended procedures for initializing, reading data, and writing commands and data, outlined by resources another company had placed on the web (again, refer to the links below). All of drivers were written in Assembly language (to allow for simple bit manipulation), so we had to pass parameters back and forth to the C code, through the stack and registers. With a 20-pin connector (not useable with the lab breadboards) and power lines intermingled with data and command lines, hooking up the entire assembly to the regulated power supply, DC power, and two ports was no simple task. The fact that the LCD still works is itself a testament to its durability; we have hooked it up backwards, reversed the polarity of some of the connections, even had to deal with documentation that was inconsistent with the original specifications found on the web site. We finally decided on using a 40-pin ribbon cable (we couldn�t find any 20-pin ones) with braided wires, splicing off the power connections and soldering them to solid wires connecting to power. The data and command cables were wired to 10-pin connectors we found in lab. The last system we had to worry about was the code for the game engine itself. With the drivers for the other subsystems in place, it was a simple task to write some utility functions to put a pixel on the screen, or to place a character somewhere, or to clear the entire screen, etc. We ended up starting from ground zero, and iteratively writing and testing code (to minimize bugs). Much time was spent on considering what data structures to use; we had access to only 256 bytes of ram on the 4414, split between the hardware and software stacks, as well as our global variables. Possible upgrading to an 8515 would mean double the RAM, but we still had the overhead taken by the hardware and the C code itself. Needless to say, efficient use of RAM was top priority. Flash program memory was used somewhat more liberally, mainly because our control of the Flash RAM usage was restricted anyway (because of the C compiler). Basically, we jammed everything that could fit into bytes, and for variables that would waste more than one bit of the byte (like the cardinal direction � 0 to 4), we packed multiple pieces of data into the byte, and did some bit masking to access the data we needed. For example, to store the direction of the snake (every bend and twist we had to go through), we knew we would have at most 256 sections of snake to deal with, each one oriented exactly one of 4 directions from the next. If each section were a byte, we would need 256 bytes to store the entire data set. Since there are only 4 directions, we only need 2 bits out of each byte to store the data, so we pack in the data from 4 segments into each byte (there are better ways to do this, but more complex instructions would be required to decode them). Our data structure size then drops from 256 bytes to 64 bytes � not exactly lightweight with our RAM restrictions, but at least it is guaranteed to fit. We also used the VRAM to help store system state � instead of tracking objects for collision detection in the internal SRAM, we used the VRAM to keep track of the collisions. All access to the LCD was through the utility classes we made � setting and getting pixels and the text. 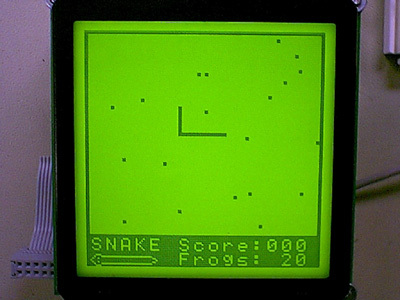 As for the other two large data structures (the 3-character isApple array and the 40-character 2x20 apple array), isApple tracks which frogs have been consumed and which have not � each bit represents the state of each frog; apple represents the position of the frogs on the screen (the reference to �apple� is a misnomer; they were apples in the original game, but since they can move, we�ve renamed them frogs). For this game, we�ve also implemented a shift register random number generator to determine the initial placement and the dynamic movement of the frogs. The code for the random number generator is small and exceedingly fast, which is perfect for our uses. The seed is set when the user presses start at the startup screen � we run a timer that goes at full clock speed until start is pressed; this gives a good psuedo-random seed to start with. A small problem with correlation does occur between each successive call to the function, but that cannot be avoided; only hidden (this is because of the shift-register). For example, in the initial frog placement, if we place the frogs one at a time on the display (x and y), we tend to have the frogs on diagonal lines. If we instead place all of the x values first, then all of the y values, the problem does not show up. Random movement of the frogs is a two-step process. First, we choose a random number each time the game engine evaluates itself, and test the number against a constant. We move the frogs based on the probability that the number we choose is less than a constant number. Then we choose random directions to move in by obtaining another random number and feeding random bits from it into a function that will give us the direction to move in. The frogs then move unless they are blocked (check the VRAM). Overall, we are very pleased with our final result. 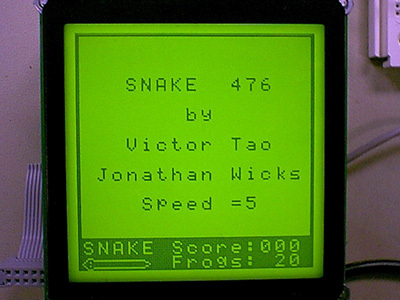 The game responds very well to user input and the snake speed has quite a bit of room to be sped up if needed. At many times during the project it seemed like we were never going to get some of the hardware working. In particular, the LCD screen caused us quite a bit of grief. The documentation provided by the manufacturer was poor and incomplete. The pins on the documentation didn't even match up with the pins in the documentation on their web page. We spent a good portion of the time on this project trying to get the LCD to respond. Luckily we were able to find a web site which provided us with enough information about the T6963C controller for us to be able to work through the problems. The controller was not to bad to setup. The specs for the controller were not difficult to find on the web and the timing for the controller didn't seem difficult. The controller responded without any problems. It actually made an excellent way to control our game since it required no debouncing and it detected key presses very accurately. The signals that the controller sent back to us were clean and easy to detect digitally on the port pins. We never had any problems with noise or false key presses which we were initial concerns we had when we chose to use the SNES controller. We were also quite worried about using C instead of assembly. We were afraid that by using C we would slow the program down too much and that it would create code that was too large to fit into the flash memory. Another issue with using C was the fact that we had to worry about how much space our global and local variables could use. If the variables became too large for the memory they could potentially stomp over the stack. Ultimately all of these worries turned out to be for nothing. The speed of C was not a problem at all since we used assembly language for all of our low level hardware communication, such as the LCD functions and the SNES controller code. With some carefully thought out data structures we were able to store quite a bit of information about the snake within a small amount of memory. Overall, I am glad that we choose to use C to create out final project. It greatly helped us to create a coherent structure for our code and it made debugging quite a bit easier. With a program this size it helped to be able to use C constructs to simplify implementation. The only real problem we had with this version of C was that at certain somewhat random times we would get "relative branch out of reach" errors when the assembler compiled the assembly file that C generated. We don't have any real regrets about the project. It would have been nice to have talked to the people who sold us the LCD in order to learn more about the LCD before we tried to hook it up. If we had more time we would have liked to have added sound to the game. The addition of sound wouldn't be too difficult and would allow for a more enjoyable game experience. We also would have liked to package the entire project up into a handheld device. This can easily be done by removing the Atmel chip from the development board and soldering the connections directly to the port pins. Both the LCD and the Atmel chip could be powered from batteries. We probably wouldn't be able to use the backlight since it draws too much current. The entire project could easily end up being about the size of a Game Boy. It also would be nice to add external memory so that we could store game levels, which would greatly enhance the gameplay. All in all, we were very pleased with the way things turned out.